Netdirekt Review 2019: Is Netdirekt a Good Hosting? Netdirekt is a budget-friendly website hosting provider. They offer a wide selection of packages from PHP hosting to SEO hosting to WordPress hosting, as well as an array of optional add-ons. 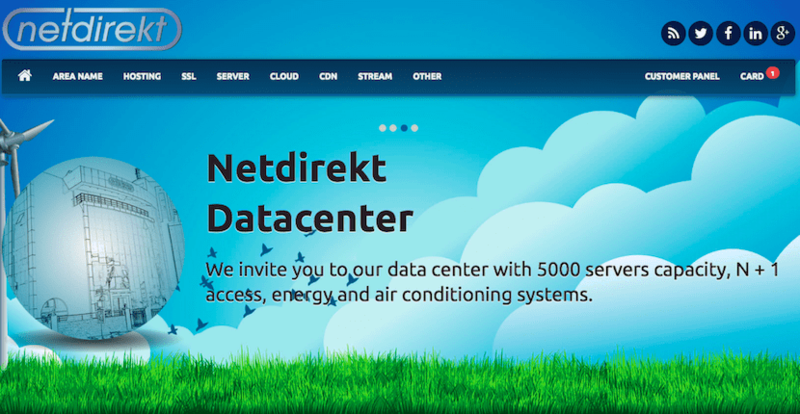 Founded in 2009, Netdirekt are a relatively new website hosting company. They don’t advertise how many customers they have, however, after chatting with their service I learned that they do own and operate their own data center, which suggests their customer base is considerable. Their website is available in Turkish, though, they also provide support in English. Netdirekt offer a comprehensive suite of website hosting services including: PHP hosting, ASP.net hosting, reseller hosting, SEO hosting, corporate website hosting, email hosting, WordPress hosting, and video hosting. They also offer domain registration and SSL certificates. Netdirekt owns and operates their own Tier II data center, which is located in Turkey. Whilst Tier II is certainly not the best, it does mean you’ll enjoy over 99.749% uptime and partial redundancy in power and cooling. What’s more, as it is owned and operated directly by Netdirekt, you can expect faster response times to issues and faster website load speeds. Their website states a 99.99% uptime guarantee, however I am unable to find a service level agreement (SLA) on their website to back this up. I also spoke with their customer support, who confirmed they do not offer any form of compensation in the event their uptime goes below 99.99%. I feel this is little more than a marketing strategy. One rather large consideration when reviewing their packages is their 15% resource cap. This means that all packages come with a 15% CPU and memory usage per user. Whilst this is common amongst some companies, I could not find any clear terms and conditions about what happens when you reach the limit. In terms of getting setup, they are harder than most companies. They only accept bank transfer by Western Union and once you’ve paid, they commit to getting you live within one day. While this may be sufficient for Turkish customers, this is quite inconvenient and a little unusual for most international clients. Their prices are very cheap compared to both international and Turkish competitors. However, their data centers are Tier II, which is likely the reason for the lower price point. It’s also worth pointing out that SSL certificates and domain registration need to be purchased on top of the website hosting packages. They offer one and two-year terms only. The price is reduced if you purchase two years upfront. For an additional monthly fee, you can add more traffic, databases, and disk space when you checkout. In terms of customer service, they do have 24/7 support. You can contact them via telephone, email, and live chat. They also have a substantial help center on their website. I’ve contacted them several times during daytime hours on live chat and their response has always been prompt. I have to add, there have been issues with communication and my requests were misunderstood several times. This is likely due to the language barrier and not the quality of the support staff. Netdirekt is a budget-friendly provider, however, they do also include some good value add-ons such as free instant activation CDN and RAID 10 technology. They have capacity for over 5,000 servers in their own Turkey-based data center. Wondering how Netdirekt stacks up against other Web Hosting companies? Enter any other Web Hosting company and we will give you a side-by-side comparison.